Expert Review of Hilarious Jewish Baby Bibs by Stupid.com, one of our picks of the top Jewish books for kids! All Babies are happier with a little Yiddish humor in their lives! Sassy babies are the most successful and most productive babies in the world. 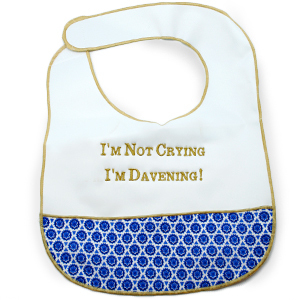 Start your Baby right with these sheyn (beautiful) Bibs. Made of high quality vinyl with embroidered text and soft Davida star fabric. You're gonna gush over these Babies!